I've been waiting patiently on the buck. Spent our muzzleloader season hoping he would step out in front of me. Never happened though. Hours after I left he would pose for my trail camera. I was getting frustrated but knew with the changing weather luck was on my side. So this morning was opening day for Rifle. With a brand new .270 WSM in hand I headed to my stand. Perfect wind, great weather, and a short prayer I was ready to settle in for my morning hunt. 6:15 I saw movement at the end of my plot. 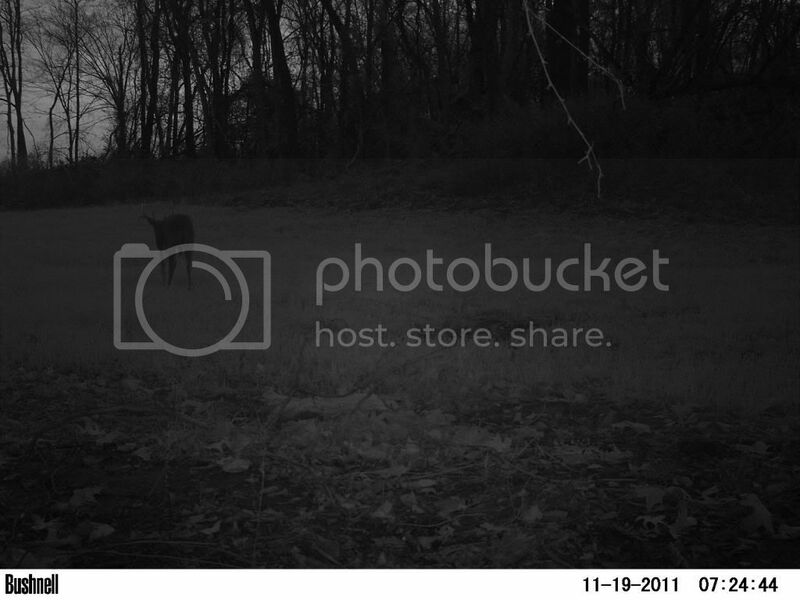 I could tell it was a buck and he was posing for my trail camera. Once he started moving away I raised my gun to get a better look. Realizing it was the ten point I been waiting so patiently for I started to shake. Watching him slowly move across the plot I was hoping my camera got one good last pic of him. When I finally got a clear shot I let the gun bark. What a great way to break in a new gun! And the pic my camera got is awesome. His last walk caught in Black and White. What a great way to honor this ol warrior of the woods. Little did he know he was walking into the christening of the new .270. Congrats on a great buck...good story! Congrats on the nice buck! By the look of the picture, you had the gun sighted in good! Like the idea of the yard sign. Just about the right hight. Sounds like a great hunt! Congrats on your success and thanks for sharing. Birchwood Taxidermy "Welcoming Trophies Big and Small"
Great hunt and great story behind it SH! Love the trail cam shot moments before the harvest. LoL Thats the best thing about election time in my opinion. Free targets! The treestand is my Throne!! Great job on christening. Looks like you had it dialed in if the target in the truck was from the 270WSM.